I admit it, I’m a thief. I took this recipe from the magazine at my hairdressers. It was a bad, bad thing to do, but I couldn’t help myself. I was under the dryer and my time was almost up so I’d never have had the time to copy it, what else could I do?? It was from Martha Stewart Living, one of the magazines I never buy, but indulge myself with when I get my hair done. That one and People, the least trashy of the trash, but I like to catch up on things so I have something to talk about besides food. After stashing the recipe in my purse before my hairdresser came to check on me, I picked up another Martha Stewart Living because it had a great recipe on the cover for a pot pie and when I got to the page where it was supposed to be, some *#%* person had ripped out the recipe! Can you believe that?! But seriously, this is a good recipe if you have time for it. There’s only a little active time, but a lot of in the oven time that makes for a succulent piece of lamb. I changed the seasonings a lot, but the original recipe was from Martha, so I’m giving her her due. I served this with polenta that I had hoped to fry and make into a cake on the side, but apparently, I have more to learn about turning leftover polenta into a fried cake, because mine pooled into normal mushy polenta, so my fry pan became just a good way to reheat the polenta. I’ll figure it out and keep you posted later. I’m suspecting it may have something to do with shaping and then refrigerating the polenta? Other good sides with this would be smashed potatoes and parsnips or browned butter orzo and romanesco or broccolini. 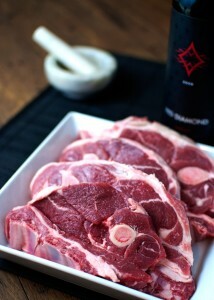 For the lamb, I used Umpqua Valley Lamb available at PCC. It’s a locally produced, pasture-raised lamb. And we had delicious Washington Merlot to go with it from our local wine store, City Cellars. -Take lamb out of refrigerator and bring to room temperature. Preheat oven to 350 degrees. -Toast fennel seeds lightly in a small pan until the aroma is released and the seeds are beginning to lightly brown. Remove to a mortar and pestle. Repeat with the coriander and cumin. Add 1 tsp coarse sea salt, pepper to taste and coarsely grind all spices, salt and pepper together. Season lamb on all sides with the spice mixture. -Heat oil in large high-sided ovenproof skillet over high heat. When oil is almost smoking, add lamb chops and sear until well browned, 3-5 minutes per side. -Add wine and vinegar. Boil until slightly reduced, about 2 minutes. Add stock, figs, bay leaves, shallots and thyme and bring to a boil. -Cover pan and put in oven to braise for 45 minutes. 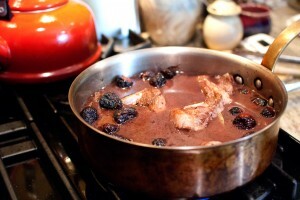 Uncover and braise, basting often, for another 45 minutes, until meat is tender and falling off the bone. 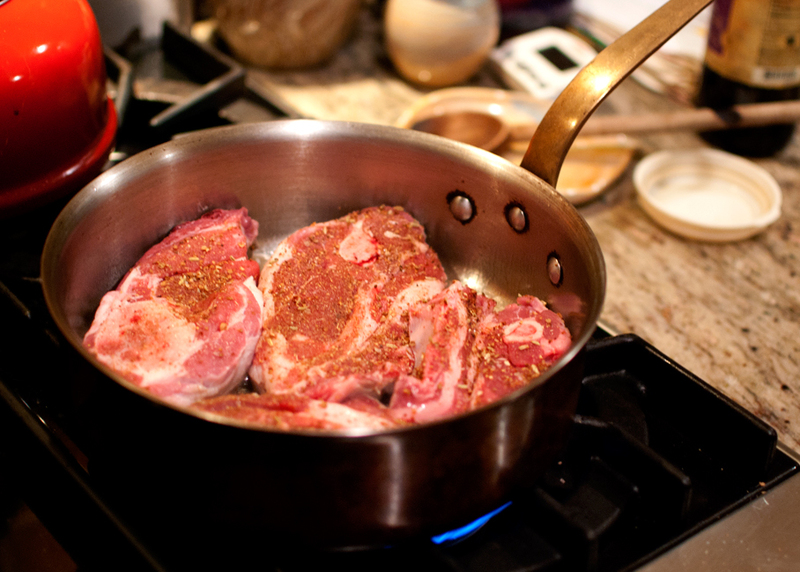 When meat is done, remove from oven and if you’d like the sauce to be a bit thicker, remove meat from pan, put pan on burner and bring sauce to a boil. Reduce the sauce until you reach desired consistency. I didn’t do this because I was ready to eat, so we just had a lot of thin, but delicious sauce. That’s why you make potatoes or orzo to go with it, so you have something to soak up all that good sauce! 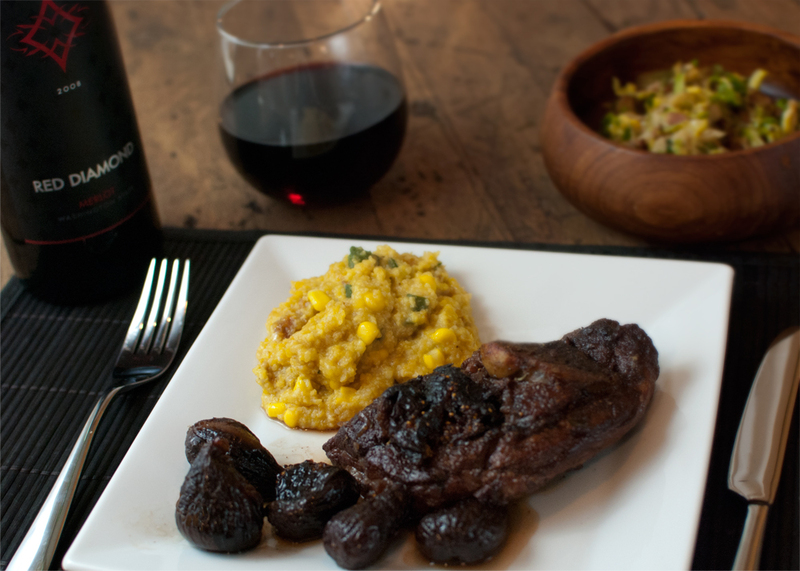 This entry was posted in main dish, Posts and tagged figs, lamb, red wine.